Team Bocinegro are the charter boat part of the East Atlantic Crew. Fishing out of Marina San Sebastian La Gomera you will experience Big Game fishing in the Canaries at the highest professional level. In our customised and air conditioned Hatteras 38 you will fish the calm waters in the lee of the island, which are only five minutes from the marina. No long runs to the fishing grounds! In these same calm Canarian waters you will find world record BLUE MARLIN, BLUEFIN TUNA, BIGEYE TUNA, ALBACORE, YELLOWFIN, SPEARFISH and WHITE MARLIN. You can also see amazing Baitball, Dolphin and Whale activity…Real Blue Planet stuff!! La Gomera is the best kept secret in the sport fishing world and only four hours from Central Europe. It’s totally safe, clean and unlike other locations there are no tropical diseases and therefore no vaccinations required. The island has good food and friendly people. We are the ONLY serious Big Game fishing charter boat based in la Gomera so days are limited. Boats from Gran Canaria, Lanzarote, Tenerife and Fuerteventura come to our waters to fish, proving that La Gomera is the ultimate destination for big game fishing in the canary islands, but no one on the planet has fished more time here than Team Bocinegro, so no one on earth knows the area better than they do! Check out our video in HD below to see what we do!! Had some great fishing with the guys on the Bocinegro. We were really looked after and had a good laugh as well as some HUGE fish !! Jason and Bocinegro only rarely fail to be the high flag boat in Gomera!!! Sherrell and I could not have enjoyed our trip to La Gomera more...a great captain and crew, super comfortable boat, perfect weather, and an IGFA BLUE MARLIN WORLD RECORD!! Thank you for providing us with such a wonderful trip...your total commitment to achieving our goal was a crucial element to our success. I cant recommend Team Bocinegro enough – if you fancy some serious Bait & Switch Marlin J’s your man. (And if you’ve had enough of the cold & rain in February he’s worth a call to see if the Tuna are biting! – take the wife, stay at the Parador and earn some brownie points! I fished with Bocinegro in August 2013 and had a great time . Great captain and crew. State of the art equipment and fantastic fishing. 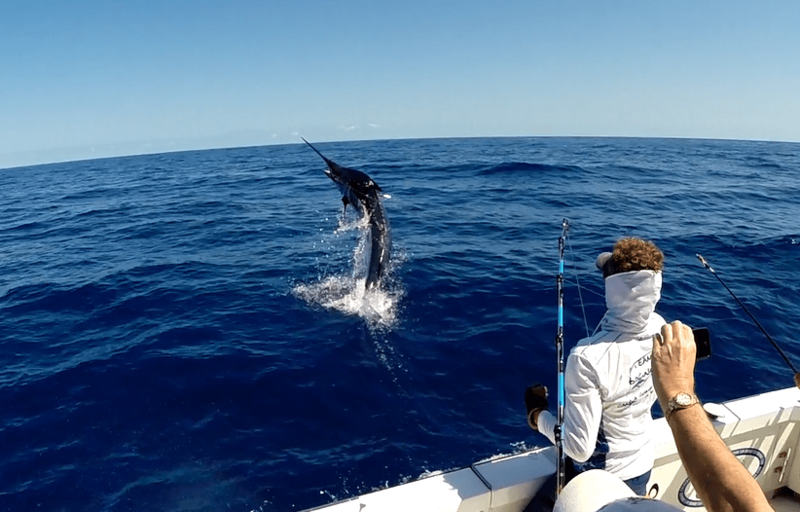 Caught 3 big blue marlin in 4 days bait and switch fishing. We a had many more chances. Liked it so much we are going back in a few weeks.